Today's NOTD pictures come to you from a seriously comfy window seat I spent my relaxing time in when on holiday in Cornwall. I really wish I had a window seat at home! 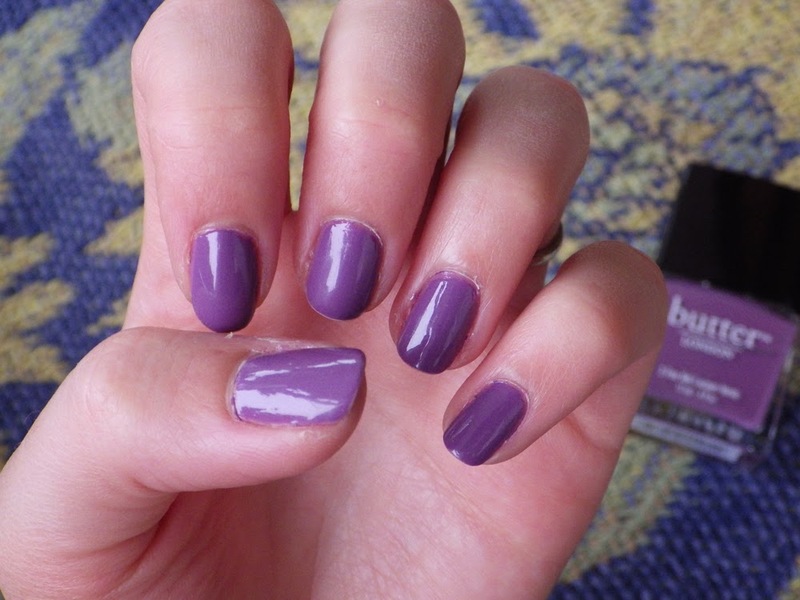 This nail varnish is the absolutely gorgeous shade Scoundrel by Butter LONDON, which I picked up for a bargain £5.99 in TKMaxx (the normal RRP is £12.00). 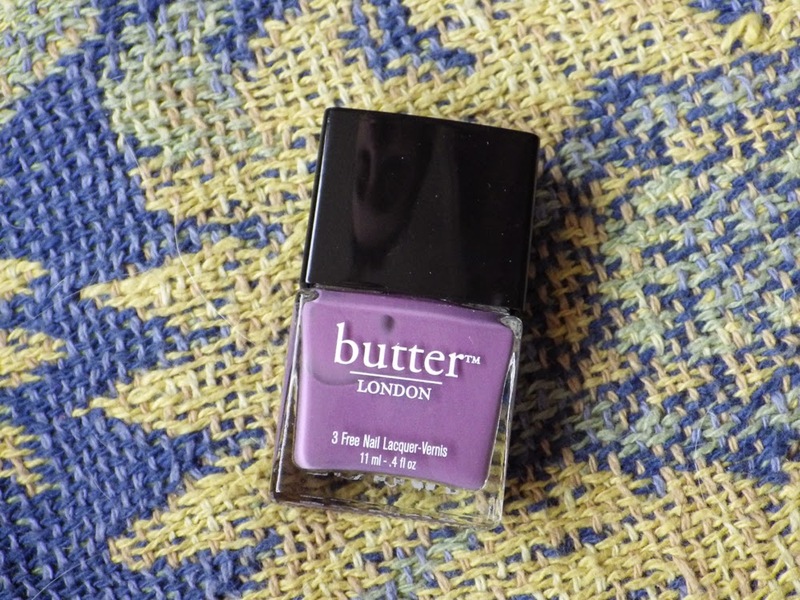 Butter LONDON is, as you may have guessed from the name, a British brand that produce "3 Free" nail varnishes - free from Formaldehyde, Toluene, and DBP. The brand can be found in larger Boots stores or online (I noticed Amazon is selling this shade for £10.00!). 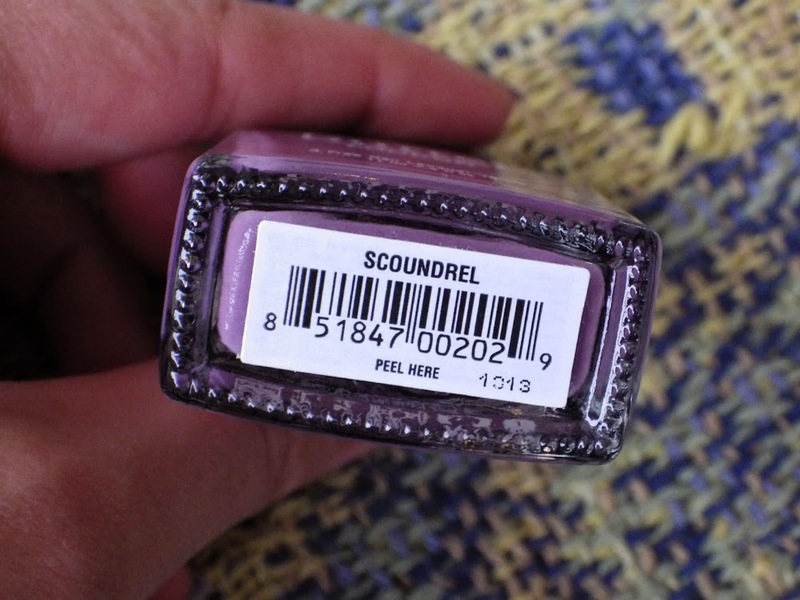 Butter LONDON describe Scoundrel as "A medium tone purplish-mauve that can appear darker or lighter depending on what clothing you are wearing". I did notice that the colour seemed to change in this way but I thought it was the lighting or something. You can even see this in the pictures above - despite taking these all in the same place with the same lighting, the colour looks darker and then lighter. I wonder if it made a difference how close my hand was to the colours in the background, as it looks lighter the further away it is from the yellow and blue knitted blanket. Anyway, whether the shade is darker or lighter, I absolutely love it! It is the perfect colour to take you into Autumn. Have you ventured into Autumnal colours on your nails yet? This is such a gorgeous shade. I've actually never owned or tried a Butter London Polish but want to try them more and more. 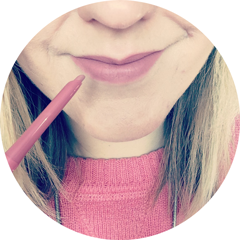 There's so many blog posts about with pretty shades. Your blog is also lovely. This is gorgeous , would go with my new purple lipstick too! Definitely all about purple this season.